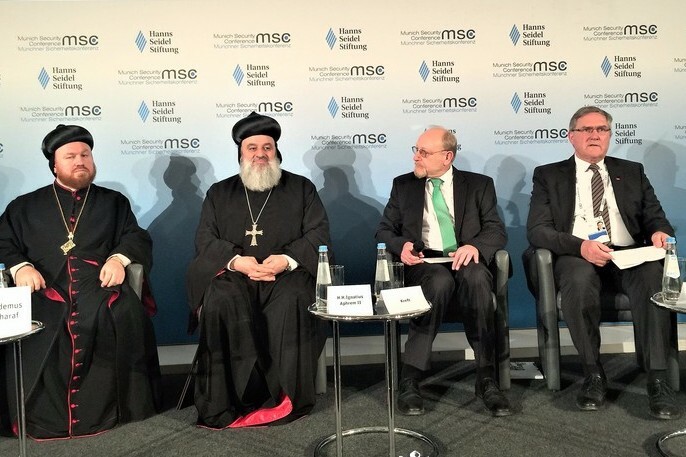 Munich (AINA) — The future of Christians in the Middle East was the subject of a panel discussion at the Munich Security Conference, held on 17-19 of February. 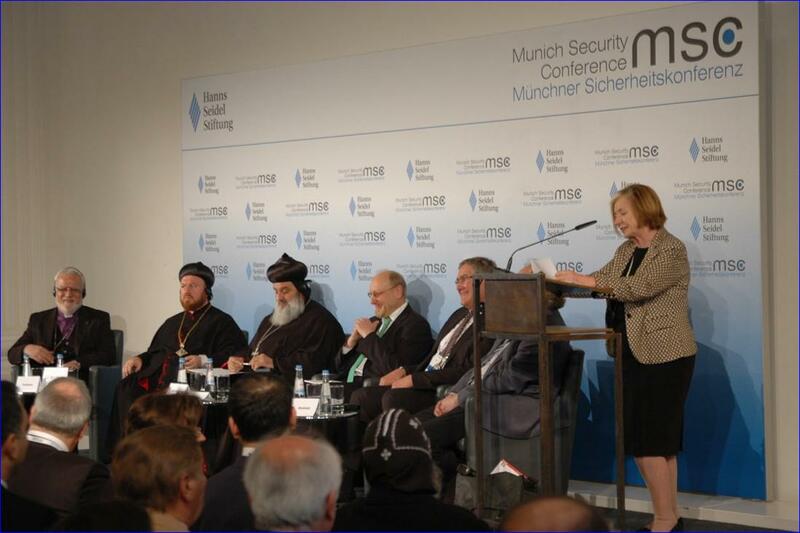 Organized by the Hanns-Seidel Foundation, the panel was titled “What future do Christians have in the Middle East?” and focused on the situation of the churches in Syria and Iraq.The panel was chaired by Professor Ursula Männle, Minister of State (ret.). Speakers included Patriarch Ignatius Aphrem II of Syriac-Orthodox Church, Dr. H.C. Heiner Bielefeldt, formerly UN Special Rapporteur on Religious Freedom and Belief, Dr. Franz-Josef Jung, Commissioner for Churches and Religious Issues of the CDU/CSU Parliamentary Group and former Defense Minister, Nicodemus Daoud Sharaf, Archbishop of Mosul, and Archimandrite Emanuel Youkhana, Chairman of Christian Aid Program Northern Iraq (CAPNI) of the Assyrian Church of the East. The session was moderated by H.E. Dr. Heinrich Kreft, Ambassador of the Federal Republic of Germany to the Grand Duchy of Luxembourg. In his speech, Patriarch Aphrem II issued an urgent call for support of the Christians in Syria and Iraq. He stressed that they need to stay in their homeland to secure Christian identity and presence in a country where Christianity emerged while they need support and require protection from an ongoing genocide, which aims to erase the Christian presence in the Middle East. The Patriarch described the current situation and living conditions of the Christians in Iraq and Syria. The hopeless situation, as he said, is a reason for many Christians to migrate. Hence, the Christians presence is dwindling. Below are excerpts from the Patriarch’s remarks (transcribed by Sarah Abed). Shlomo, this means peace in Aramaic and that is how we greet each other and that is what we are missing in our life these days. Thank you for the Hanns-Seidel Stifung for the opportunity to raise our voice; we have been ignored for some time as Christians in the Middle East and we welcome every opportunity to be heard. We are here because there is always peace to be sought and to be achieved. The Syrian conflict should be settled in a peaceful manner. Violence only brings on more violence, as Pope Francis said. The war in Syria is not a civil war. What we suffer from in Syria and Iraq cannot be called a civil war. However, it is [a conflict] due to religious fanaticism and extremism. This is sweeping over the entire region and extending out of the borders of the Middle East. Crossing into Europe and the entire world. About a 100 years ago we suffered horrible genocide in the Middle East; though it didn’t stop in 1915 or 1918; it continues to this day. Not only Christians are dying, but what is happening is not short of genocide. Populations are being uprooted, forced to leave their home, Churches are being destroyed, clergy is killed and bishops are being kidnapped. Both Orthodox archbishops from Aleppo were kidnapped by ISIS on April 22nd, 2013. Not much is known about them since then. What’s happening in the Middle East are not cases [of violence] against individuals but is an organized effort to wipe out Christianity from the Middle East. This will happen if we do not stand up and demand an end to this. Statistics are very alarming in Syria, Iraq, but also in Turkey and in the Holy Land. Christians are leaving the region at an alarming rate. We want you to help us stop that, we appreciate Germany’s generosity to help the refugees but we want you to help us keep Christians in the Middle East. We lived there for 2000 years as Christians and many millennia before that as indigenous people of the region. We are not guests there, we received many people into our homeland [Mesopotamia and Syria], and we lived with others, interacted peacefully with them, and learned how to make them accept us. Now, ideologies of extremism, like Wahhabism and Muslim Brotherhood have made living conditions very difficult for Christians, have destroyed the peaceful living of various religious groups in the Middle East and Syria — along with the international attempt to enforce “regime change” in Syria. We are scared if the secular governments were to be overturned and Muslim Brotherhood or Wahhabism takes over. The Syrian Regime is not the best, has its shortcomings. The legitimate secular Syrian Government treats us based on our humanity and citizenship – not our religion. If a religious regime is established in Syria that will be the end of Christianity! What we need from the international community is to help us to stay in the Middle East. We need good relations with our neighbors. We need a strong government and security. We need to be able to continue living with our millennia old traditions and be able to practice our religion freely. We want to be heard, having support and prayers is important but we also want to have groups that advocate for us. People need to feel secure about returning to their homes. Churches are overwhelmed with the humanitarian services they are providing to locals in the northeast region of Syria: food, settlement for displaced families, education, health services and even major surgeries. [Generally] in the field of humanitarian aid, Churches are taking a government role, providing help, education, food, health care, housing and settlements for the displaced, all in government controlled areas. There are many people who are helping us, but very little of the 2.5 Billion Euro provided by Germany reaches Christians. Here we are again discriminated. Why we are being discriminated against? As an exception, the German Ministry for Development has cooperated with us, is helping people through the churches. [Western] Governments should not feel reluctant to help Christians. The churches in Syria, in Damascus and other parts of the country help everyone, not just Christians. Many organizations and governments feel to separate state and religion when providing aid and charity, but that shouldn’t be the case here. Majority of those that the churches are helping are Muslim people. This is part of our Christian mission. Our people [Assyrians/Chaldeans/Syriacs] lived mostly in northern Iraq, in Mosul and in the Nineveh Plains. Baghdad had [prior to the war] 60,000 Syriac-Orthodox believers. This number is down to 6,000 now. People need to feel secure before they can return to their homes. We need security and I would like to propose a step further: We believe there is an opportunity for the Christians can settle in a designated area as “safe haven” with international support, at least initially until they can protect themselves. Iraqi government discussed this matter and it was suggested that the Nineveh [Plains] region should be designated as Christian region. Even the former president Jalal Talabani supported the idea. This is not against the unity of Iraq; the latter is not there unfortunately. This will give our people some security and identity. It will give those who live abroad the feeling that they can go back to their ancestral roots. What we need is Syria is a strong government; we need respect to all groups in the country. Christians are [often] accused of being loyal to the regime — yes we are loyal to the legitimate regime. This derives from our religion. We are loyal to our country, to our ancestral homeland and the legitimate Syrian government but not loyal to a person. I heard some remarks that Christians are fleeing because of the persecution by the regime. I want to correct this. Christians are not fleeing because the regime; Herewith I am not defending the regime. Our people left Raqqa, Deyr-al-Zor, Hasaka to come to areas controlled by the regime. Christians cannot go to areas controlled by Al-Nusra, Daesh (IS) and other [extremist] groups. If they do, they are held hostages, kept as dhimmis and pay taxes for protection. Two years ago we were meeting with President Obama in the White House, together five Patriarchs [from the Middle East]. With respect to Syria, Obama said “You Christians are protected by the regime”. Talking further, Obama said also that “there is nothing called moderate opposition”, this is a fantasy. Now we are told again, that there is “moderate opposition” in Syria.